We all love to indulge around the holidays or maybe even on a date night. Super excited to have partners up with one of my favorite cheese brands Kerrygold USA. One of the things my husband and I love to do is create cheese/meat boards, for ourselves or guests. We enjoy them with either wine or beer. Creating a board can be so much fun. Below I will give you ideas on some Kerrygold cheeses and plating. I hope you enjoy. Lets start with the Cheeses. You want to have as least 3 to 5 types of cheese. Depending on how big your board/canvas will be or how many people you will be entertaining. Kerrygold Dubliner with Irish stout: . The classic flavor combination brings out the sweet, nutty, rich flavor of Dubliner Cheese and swirls and tumbles it together with the malty, caramel, bitter flavor of a perfect pint of Irish Stout. Kerrygold Aged Cheddar with Irish Whiskey: rich and creamy Aged Cheddar now has unique undertones of the smooth, woody and nutty taste of pure Irish Whiskey. Entrenched in the history and traditions of Ireland, Cheddar and whiskey are now together in one spirited Irish grass-fed cow’s milk cheese. Kerrygold Aged Cheddar: a pasteurized, grass-fed cow’s milk cheese that is aged for one year and undergoes a stringent grading process as it matures. Only the best-tasting cheese makes it through, resulting in a Cheddar that is rich and full-bodied with a smooth finish. Kerrygold Blarney Castle: a mild and creamy cow’s milk cheese with rich and velvety undertones. It both feels and tastes similar to a young Dutch Gouda cheese and makes a perfect complement to fresh fruit and a glass of crisp wine, like Sauvignon Blanc. Kerrygold Dubliner: a robust aged cow’s milk cheese with a bit of a hard texture similar to a Cheddar. In one bite you can taste the diversity of flavors – from nutty to sharp to sweet – that can only come from a natural cheese made from the milk of grass-fed cows. 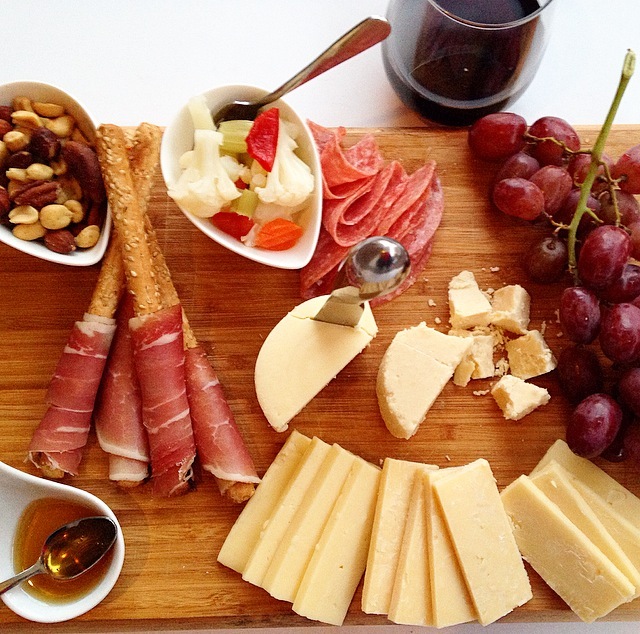 Nuts and Meats: To add that additional saltiness to the board I like cuts of meat like prosciutto and salami. Also the nuts work great as well. Some favorites of mine are pecans and almonds. Breads and Crackers: Who doesn’t love bread and cheese? Adding that starch is a great way to enjoy different cheeses. Get creative and wrap some prosciutto to some bread sticks. Fresh Fruits: Adding some color to the board with fruit is another delicious component. From strawberries to grapes, fruit pairs beautifully with cheese. You can also enjoy dried fruits as well. Cutting Board: These aren’t just made for cutting your fruits and veggies. Using different kinds of cutting boards to serve your cheese can make the presentation look amazing. Chalk board: This is another great option. Getting creative is key when serving a cheese board. You can head to the dollar store or to an office store. I actually found my chalk board at target. The chalk board is great to label your cheese. Separate Knives: Make sure you have a different knife or small spoon for each cheese. Remove Cheese: Remember to take out the cheeses 30 minutes to an hour before serving. The cold mutes the flavors of the cheese. Last but not least: Have fun when creating. Try different things, you will be surprised at what you may like. This is my kind of thing.how can you not like trying a variety of cheeses in a fun way! I love this idea! I have had something similar in restaurants, but never thought of doing it at home. Looking forward to creating a board, the next time I entertain :). Thanks for sharing! I love the Kerrygold products. My two favorites are their soft Irish butter and their sharp aged cheddar. Great idea with the boards.